As part of the Indian Navy’s overseas deployment to the West Coast of Africa and the Mediterranean Sea, three Indian warships, INS Mumbai, INS Trishul and INS Aditya, arrived at Jeddah on 16 May 2017 for a three-day visit. The warships will engage extensively with the Saudi Arabian Navy during their stay in the country. Apart from professional interactions, sports and social engagements are also planned, which would go a long way in enhancing co-operation and understanding between these important navies of the Indian Ocean Region (IOR). The visiting ships, headed by Rear Admiral RB Pandit, the Flag Officer Commanding Western Fleet (FOCWF), who is flying his flag on the guided missile destroyer INS Mumbai, are part of the Indian Navy’s Western Naval Command and are based at Mumbai. India and Saudi Arabia enjoy cordial and friendly relations, reflecting centuries old economic and socio-cultural ties. Bilateral trade between the countries has shown remarkable growth and has registered a three-fold increase in the last five years. The 1.8 million–strong Indian community in Saudi-Arabia is the largest expatriate community in the Kingdom and is the ‘most preferred community’ due to their expertise, sense of discipline, and law abiding nature. The Haj pilgrimage is another important component of the bilateral relations with over 1,65,000 Indians performing Haj every year. Building upon the rich and longstanding relations that have existed between India and Saudi Arabia, both nations have developed warm relations in several spheres. The current visit seeks to underscore India’s peaceful presence and solidarity with friendly countries of the Indian Ocean and, in particular, to strengthen the existing bonds between India and Saudi Arabia. 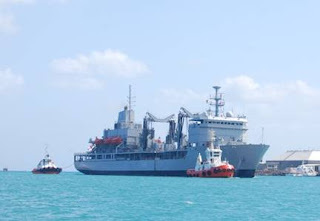 Indian Naval assets have been increasingly deployed in recent times to address the main maritime concerns of the region, including piracy off the coast of Somalia. In addition, the Indian Navy has also been involved in assisting countries in the Indian Ocean Region with Hydrographic Survey, Search and Rescue and other such capacity-building and capability-enhancement activities. The current deployment into the Mediterranean will contribute towards the Indian Navy’s efforts to consolidate Inter Operability and forge strong bonds of friendship across the seas.